Die Villa befindet sich in Nerotrivia-Dafni Evias, 100 km vom Zentrum von Athen, 25 km von der Stadt Chalkida und 7,5 km vom schönen Fischerdorf Politika entfernt. Das Dorf liegt abseits der indiskreten Blicke, auf den Berg, in einem schönen Kiefernwald. Es ist nur 5 km vom blau bewässerten Strand von Dafni entfernt. Der Außenbereich ist von einem privaten Swimmingpool, einem Garten, einem Parkplatz und einem Lagerhaus auf einem vier Hektar großen Grundstück umgeben. Das Hauptgebäude verfügt über drei Schlafzimmer und zwei Toiletten, von denen sich eines in einem der Schlafzimmer befindet. Es gibt auch eine Küche und ein Wohnzimmer. Im Freien, die große runde Terrasse und die amphitheatralische Aussicht auf den Berg und das Meer komponieren die Figur der Villa Fairytale auf einzigartige Weise. Es ist komplett mit allen Annehmlichkeiten und der Technologie moderner Unterkünfte ausgestattet, immer in völliger Harmonie mit Stein und Holz. Die Umgebung ist ideal für große Familien, Naturliebhaber und Menschen, die Isolation und Ruhe suchen. Terraces all around the house with extended views on olive groves, the sea and mainland Greece mountains. In the mids of a quiet nature in al large swimming pool ! We trully enjoyed our week at Evia with Anthonis as a great host. 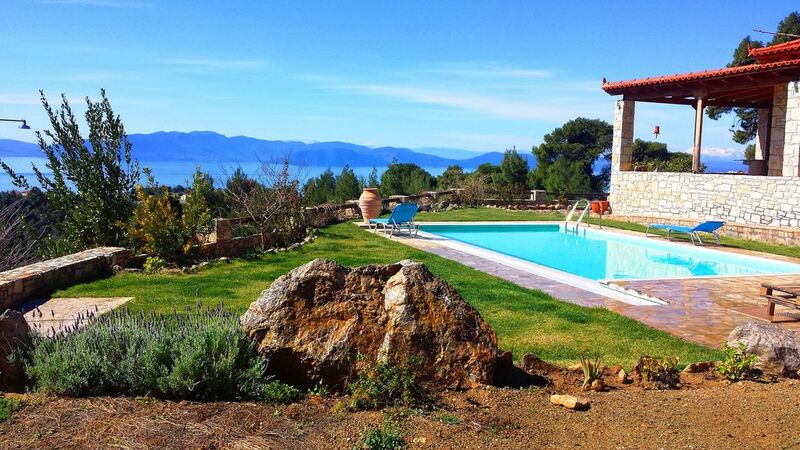 We have just come back from a 2 week stay at Antonis’ lovely villa. The villa is just as it’s shown in the photos. The covered terrace wraps around three sides of the house providing plenty of cool shade and a comfortable outdoor dining area with a great view of the sea. Inside is a simple open plan living space with 3 bedrooms at the back of the house, one ensuite and one other shower room. The kitchen is well kitted out, especially for making coffee. The owner kindly supplied the basics, oil, salt, sugar, coffee etc and a welcoming bottle of chilled wine and a watermelon in the fridge. The house has an impressive position, up a steep drive above the quiet road. It’s on the edge of the pine forest which covers the hills behind the house. It’s not overlooked, with the nearest neighbours house at the bottom of the drive. So the kid’s noisy late evening splashing around in the pool didn’t disturb anyone. We could watch the sunset over the sea from the terrace. The pool is new and the water was not strongly chlorinated, so perfect for cooling off during the heat of the day. It’s an island that was new to us and it turned out to be a very friendly and untouristy place. Many of the local houses are just used at the weekends by Athenians. There aren’t many tourist sites, the local beaches are quiet, even in August and the tavernas sell good local food. Nerotrivia, the local village has a bakery, small shop, taverna and a butcher. A hire car is essential to explore. We drove up to the high mountains in the centre of the island where it was cool enough to walk. And we drove the windy roads to the Aegean side of the island, which took about an hour. But not an easy drive. It would take 2/3 hours to drive to the northern or southern ends of the island from the villa. We are a family of 5, with 3 sons aged between 17 and 11 and enjoy being in the countryside so this villa suited us brilliantly. Thank you very much Antonis and family!